The British media are attempting to blame the open public butchery with knives of two Muslim Pakistanis in South London on other Pakistanis. In fact, the bloody murders were perpetrated by a Tamil street gang, the Tooting Boys. With almost mathematical predictability, the UK media are misrepresenting the Tooting Boys as "Pakistanis". The game of "blaming the victim" is part and parcel of the long-established UK policy of "divide and rule" of which the UK media enthusiastically takes part. And they're taking part right now by publishing false claims designed to misdirect public anger. "Prime suspects in the double killing in Fircroft Road, Tooting, are thought to be members of the Tooting Boys - a violent Pakistani street gang involved in guns, drugs, intimidation and kidnap." The British media need to learn their street gangs and their geography. The Tooting Boys are indeed the prime suspects, but they are most certainly not "Pakistani". The Tooting Boys are a notorious hindoo Tamil gang: see the first article below. Tamils come from lands over a thousand miles (more than 1,600 km) from Pakistan. A NOTORIOUS street gang dubbed the Tooting Boys is thought to be behind the frenzied double murder of two Pakistani brothers. Mohammad and Hayder Ali were dragged from their van on Friday night and butchered by a 15-strong mob armed with knives and baseball bats. Mohammad, 23, from Battersea, and Hayder, 24, from Southfields, died from stab wounds. Prime suspects in the double killing in Fircroft Road, Tooting, are thought to be members of the Tooting Boys - a violent Pakistani street gang involved in guns, drugs, intimidation and kidnap. Muslim leaders warned yesterday further bloody clashes could follow unless Government chiefs tackled escalating violence between warring Asian youngsters. Toaha Qureshi, head of Proseed - a scheme to empower young Muslims which is backed by Mayor Ken Livingstone - said: "The Tooting Boys are a major gang, involved in guns and drugs. "They clash with other Asian gangs but this is nothing to do with religion. "The majority of members have had no proper education and numerous criminal convictions. They have no direction." The horror unfolded at around 12.15am when up to 15 men surrounded the brothers and a third man in their white Mercedes van and smashed the windows. The brothers were dragged out and attacked near the junction with Tooting High Street but the third man - the driver - was not harmed. Cops seized a terrifying array of weaponry - including baseball bats and knives - and arrested seven men. Fircroft Road was closed for most of Saturday while forensic officers looked for clues. Detectives were quizzing four suspects yesterday, and three were bailed. They believe the area was teeming with potential witnesses. One eyewitness told the South London Press: "I saw a large mob steaming along the street, waving sticks and knives. "They were shouting at the tops of their voices. We heard one guy screaming, 'I'm gonna f*****g stab you'." "We dialled 999. We could see one victim lying motionless on the ground." Neighbour George Tagoe, 52, added: "We kept thinking the two men would wake up. "As the paramedics tried to resuscitate one man, he screamed, 'No, no, no'. It was horrifying." Detective Chief Inspector Mick Duthie, said: "This attack has resulted in a family losing not one, but two sons." Information to the Murder Squad on 020 8721 4155 or Crimestoppers anonymously on 0800 555 111. The pregnant wife of a man murdered alongside his brother last Saturday has spoken of the family's devastation. Sadia Ali, 24, who is due to give birth to the couple's second child in three months, said she did not know how she would cope without husband Mohammad. Mohammad, 24, and his 23-year-old brother Hayder were attacked by about 15 men armed with machetes and baseball bats in Tooting, south London. 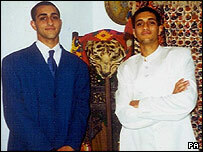 Their father, Shahid Ali, said his sons were "massacred by butchers". The brothers were in a white Mercedes van in Fircroft Road when the mob surrounded the vehicle shortly after midday. The gang smashed a window and got the victims out of the van before repeatedly stabbing them. A third man driving the van escaped unharmed. Mr Ali, 50, from Southfields, south London, said his wife Shahzadi was in shock and was still expecting her boys to walk in through the front door. "To lose one son is devastating - but to lose your two sons so suddenly and by such butchery... I can't find the words," he said. "They were handsome young boys, they had jobs... in the prime of their life. They did not deserve this. They were just massacred." He said Hayder, who lived in Southfields, was engaged and was due to get married in November. Mohammad, an IT sales manager from Battersea, and his wife Sadia have a three-year-old son and were expecting their second child. Sadia, who is six months pregnant, said the couple were just about to buy a house and "things were finally settling down". "I never thought I would be raising my children on my own," she said. "We had planned our lives together. I don't know how I'm going to cope. I can't deal with it, it's too hard, no words can describe how I feel. "The family is not coping with this. No-one can accept what's happened." Five men were being questioned by police in connection with the murders, bringing the number of arrests to 10. Police, who have appealed for witnesses, said they were keeping an open mind about the motive for the attack. who's dividing who? — eh? TAMILS NOT REALTED TO STABBINGS IN TOOTING MISLEADING FABRICATED ARTICLE ABOVE. — ?